As the supdawg days of summer slowly give way to autumn, law schools across the country fill with a palpable sense of foreboding. Representatives from Toronto firms will be rolling up to your school on their magic carpets, and you must remember one thing: never brush your teeth with your suit on. The first rule of OCIs is that toothpaste will always drip on your garments. Think of it as tempting some very vengeful Gods. You don’t want to be the Icarus of your school. Now that the most important tidbit is out there, I will move this train right along. WELCOME TO THE FIRST ANNUAL OCI BONANZA TIP BLITZ WITH YOUR HOST CRAIG “HAWK TALONCLAW” POWER! Sycophants have told me that I have more tips than a bag of darts. I’m inclined to agree. However, the advice I give may not make a lick of difference to you. That’s okay. If you’re quick on your feet, intelligent, personable, nice, memorable and confident, then you’ll have no trouble in this process. Conversely, if you’re rude, arrogant, self-entitled and artificial, then the process will have no trouble with you. Please keep in mind that this is an exhausting, but not exhaustive list of OCI tips. For a full list, you should probably try google or something. Bottom line: Let them get to know you. Don’t be an image, be a person. As a second year law student, there’s a good chance that you know relatively little about the practice of law. I know I sure didn’t. At this point, you’re not supposed to. Don’t get yourself into an awkward situation because you’re trying to impress a tax lawyer with your potentially incorrect knowledge of an upside down butterfly restructuring transaction. If you do happen to be well-versed in an area of law, by all means, do it up sick style. However, keep in mind that these firms are hiring students – all you really need is a keen interest in learning. Bottom line: They’re hiring future lawyers. Find out who’s interviewing you, and read the person’s bio (you will it find on the firm’s website). If your interviewer is a securities lawyer specializing in mining, you could ask her how she got into that area, if that’s what she pictured herself doing when she first started law, if she’s ever been to a mine, etc. There are some students who will go so far as to search Quicklaw for cases/transactions the lawyers at the firm were involved in. Call me crazy, but I think that’s a bit much. I imagine if I was in the interviewer chair, and someone wanted to talk about the finer points of a case I was involved in, I would have two words for him/her: “Dude… seriously?” What insight can you possibly give them about a case that they probably remember like the back of their hand? You’re obviously not going to critique their lawyering style, so the only message you send is that you’re attempting very very hard to ingratiate yourself. You’re better than that. From what I can gather, you can get all the information you need from the firm’s website. Know about their practice areas, their student programs, etc. It’s very important that you ask good questions. You have to allow the firms a chance to sell themselves to you, as they are competing almost as much as the students are. Ask a question about the firm that shows that you have done a bit of research, and then pretend to be interested in the answer. Also, don’t ask vague questions, such as “What’s your articling program like?” Have specific questions prepared which will allow them to elaborate favorably on their organization. Guys: Wear a nice fitted suit, and observe common fashion protocols. Looking the part, as shallow as it sounds, is important. Ladies: During OCI’s women should always wear prom dresses. Okay, so I know nothing about women’s fashion. I’ll just stick to the fellows. 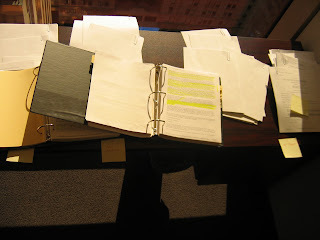 Firms bill clients for the time a summer student spends on their file. A Bay Street summer student’s billing rate, while much less than an actual lawyer’s, is by no means cheap. During the course of your work, you might get the chance to meet a client. When you do, I think it is important that you look like you are worth the money they are paying for you. Of course, no one at any law firm will ever tell you this, but I’d bet dollars to donuts that they think it. Make their decision to give you an offer an easy one. In an interview you should look like you could start work tomorrow. I don’t ever want to be accused of being a generalist, so I will now list some fashion tips for the concerned gentleman. Black/Really Dark Shirts: Some people say that one should never ever wear a black shirt to the office. I have to disagree. It’s perfectly acceptable if your office is a cell phone booth in the mall. Wear a light-colored shirt. A pattern is fine, so long as it is not distracting. Cologne: The only reason you should ever wear cologne to an OCI is if you have to rush off to a high school dance right after interviews. No cologne. 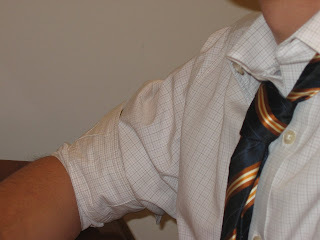 Tie: At your belt, or about 2-3 centimeters above. Patterns are tight, but nothing too crazy. You want your personality to stand out, not your tie. Black Suits: Some have said that black suits are too formal for this sort of thing. In actuality, it doesn’t matter. No one really cares. In fact, one could argue that a black suit is more versatile than other options. After a long day, some firms will host cocktail parties. Remember that time James Bond wore his blue pinstriped suit to that cocktail party? Me neither. That said, you don’t have to wear a black suit to a cocktail party. As I said, no one cares. Actually, just ignore this entire paragraph. This post was not designed to get you a job at Cassels Brock. In fact, I don’t want all of you to work there. There simply aren’t enough chairs. Some of you might have to go to other firms, and that’s totally cool. We’ll still go for drinks and email each other and stuff. This post was designed to give you some personal insight into the OCI process. My lawyer is telling me that I have to tell you that the stuff I talked about above is not the opinion of Cassels Brock & Blackwell or Warner Brothers. Back to my plug. If I had to choose any firm to work at, it would be the one in Boston Legal. However, if I had to choose a real Toronto law firm, it would be Cassels Brock & Blackwell. The esoteric concept of “fit” may not make much sense to you now, but there is some truth to it. I just “fit” there, strange as it sounds. This doesn’t mean that Cassels (or any other firm) only hires one type of person; it’s much more complex than that. I can’t explain it, but you’ll know it when you feel it. If you want more technical insight into the type of work you could end up doing, feel free to check out the rest of the blog, which was written by four very different law students who all “fit” with Cassels Brock. You’ll find your fit somewhere, so just go with the flow and don’t forget what I said about brushing your teeth. Just a random 6:07 pm thought, and a quick break from the Assignment to End All Assignments. Ok. Sarah J is in my office saying hello (well… goodbye, actually). She is leaving now for good (until next year). Bye Sarah. Bye readers. This is Goodbye…by Sarah J. The end of an era…or a summer…or 15 weeks of practical experience at a Bay street law firm. As you’re editing cover letters and assembling application packages, you’re probably also wondering if you will ever be able to tell the difference between the 30 plus firms that you’re applying to. Eventually the firms, and their people, start to distinguish themselves. But how do you figure that out at this stage? Ask a current summer student what it is that made his or her experience so memorable?! The students at Cassels had no formal rotation for the summer. If you have no idea what type of law interests you, this allows you to try a little bit of everything. If you know exactly what you want to spend your summer doing, it means you can focus on getting work specifically from lawyers in that area. I came to the firm with a strong desire to work in litigation and I spent the majority of my summer doing just that. Within the world of advocacy, I was exposed to commercial, municipal, employment, product liability, life sciences, and franchise files. The work included conducting research and writing memos, attending mediations, case conferences, and discoveries, analyzing legal arguments for trial, drafting defences, acquiring adjournments at court, and preparing and editing a paper on a substantial area of the law. The flexibility of our system also meant that I could dabble in the world of financial services and I was pleasantly surprised to find how much I enjoyed the work. I assisted in the drafting of certificates and resolutions, created a corporate search summary, collected and organized documents for closing books, listened in on conference calls, and interacted with clients. The first student I met at Cassels was Rick. I was happy to find that like me, this guy enjoyed sports, traveling, and good food. It didn’t take too long before I found out that Rick is also always extremely positive, and is the most likely of us all to make an appearance on the “Hills”. As I met more of the students with whom I would be spending my summer, it become apparent that we had a great group! Laura, upon learning I was new in the city, was instantly full of restaurant recommendations and local hotspots. Eric, after hearing me express some concern about my research findings, offered to spend his afternoon helping me track down case law. Our student directors, the members of the student committee, and our mentors also helped to make the summer as stress free as possible. Their participation at student events, their patient instructions, and their helpful advice was always welcomed and appreciated. It all began on Jen’s birthday when the summer students embarked on a night of fun, food, and festivities. Craig told some of his now-famous jokes, Mow talked fashion, and the rest of us consumed more than our usual 2 drink maximum. The entertainment continued at our numerous summer social events. Some of my favourite memories include tracking down a tide-to-go with Tracy in Niagara, driving a golf cart in matching yellow shirts with Micah and golfing in the presence of the “legend” Jon at Diamond Back, organizing a summer student event with Lori, and screaming at horses with Mordy at Woodbine. But we didn’t have to leave the office to have a good time. It was probably the day to day routines we established that made the summer fly by so fast (especially since most of them involved food). After eight weeks of daily arrowroots with Stefanie on 18, I moved to 22 for chocolate with David. When I wasn’t typing away at my desk, I might have been grabbing booster juice with Chris at four o’clock, eating hotdogs with Jess on a Friday, chirping J.B. about life in the short lane, or debating the lifespan of a stress ball stuck on the roof with Ryan. My summer has been a combination of hard work and hilarity. If you’re a prospective summer student who gets to go through the “treat” of applications and interviews this year: good luck! I hope you too find a job with a firm that fits! Last week for our final firm-funded social event the Cassels Brock summer student team headed to Woodbine Racetrack for an evening of good food and gambling. We had been given the opportunity to plan our own event and although there were several appealing options open to us, a night out watching the sport of kings was too appealing to pass up. After arriving in beautiful Rexdale we were treated to a tour of the facility. One of the highlights of the tour was a height and weight measurement station which allowed visitors to determine whether they met the requirements for being a jockey. There was a heartbreaking moment however, when one aspiring jockey learned that although he met the height requirements, the free Cassels lunches had made him too heavy to participate in competitive horse racing. The final stop on our tour was the paddocks and as we watched the horses being warmed up before the first race, some of us tried to determine which ones looked like winners. Unfortunately this strategy proved to be ineffective, as we learned that you can’t tell which horse is the fastest by watching them trot around before the race. At dinner we enjoyed a delicious buffet meal at Favourites restaurant, where we were fortunate enough to be seated right by the windows overlooking the track. This provided an excellent view of the action and allowed me to see each horse that I bet on come in dead last every race. Seriously, my luck could not have been any worse. In the fifth race I swear the horse I bet on stopped halfway around the track so that its jockey could have a smoke break. On a lighter note, Cassels Brock sponsored one of the races and I was among the lucky few chosen to go down to the winner’s circle to present a crystal vase to the owner of the winning horse. Although some of us left Woodbine with lighter pockets than others, a good time was had by all. A special thanks goes out to Lori for planning an exciting night and to Cassels for footing the bill. Tell Me Why…by Sarah J. 10. My love of recruiting doesn’t have to stop just because school has! As potential future summer students visit the firm, the current students take turns giving them tours, introducing them to lawyers, and answering questions about what it is we do all day. 9. You will be exposed to real files and have direct contact with real clients. Lawyers are eager to take you to court and want you to attend mediations, discoveries, and motions. They want you to see how a closing works and to sit in on conference calls – all you have to do is ask. 8. The firm will feed you every day! We feast on a lunch buffet starting at noon which saves students and lawyers some serious time, energy, and money. 7. If you’re worried you don’t know anything practical coming out of law school, you’ll soon be equipped with the tools you need to thrive at work. We started with an intense one week training session which consisted of legal research training, computer orientation, and seminars on due diligence, business basics, and motion writing. Our bi-weekly “Tips and Tricks” sessions throughout the summer have allowed us to share the helpful hints we’ve learned with each other. We’ve also had a series of tax seminars focused on how tax law relates to a business law practice, as well as writing, negotiation, and business development seminars. 6. You might get to write a blog documenting your summer! 5. The firm gives feedback! The two performance evaluations are a great way to see your areas of strength and allow you to make improvements throughout the summer. 4. The student committee and student mentors are dedicated to ensuring your summer is a success and organize numerous events outside of the office. This summer our social events consisted of Jet Boating and Wine Tasting in Niagara, Gambling at Woodbine Racetrack, Golfing at Diamond Back Golf Club, and several lunches and dinners at trendy restaurants in Toronto. 3. There are numerous opportunities to get involved in charity work. Whether it’s manoeuvring wheelchairs, spinning on a stationary bike, or running through the downtown core, summer students are encouraged to participate in charity events and are strongly supported by the firm! 2. You will develop lasting friendships with a group of fantastic students. You will choose to go for drinks together after work, and will make plans to see each other on the weekends. By the second week of May you will have 17 new facebook friends! 1. If your birthday falls in a summer month, we will celebrate it! Not only will the group of summer students and our Student Program co-ordinators gather together to sing “Happy Birthday”, but you will get a cake and it will be delicious. Comments Off on Tell Me Why…by Sarah J.